Bring wrens and chickadees a fun and charming roost with the Home Bazaar Little Hanging Wren House. This soft yellow home has white shutters flanking the 1.25" diameter entrance hole, and cedar shingles atop the roof. A window box with fabric flowers rests beneath the entrance hole, creating a festive feel. Remove the flowers for use outdoors, to keep the hole more open and visible. Ventilation slots along two sides of the house keep the interior temperature regulated, and the bottom panel slides out for cleaning. Hang this home with the attached metal chain, for a comfortable and convenient roost. 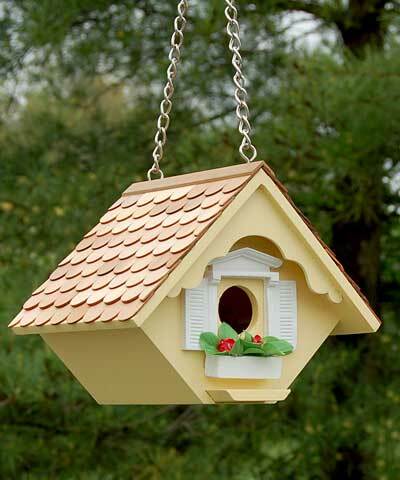 Offer house wrens a functional and exciting home with this Little Hanging Wren House.